I'm using JNDI + Hibernate + JBoss EAP 6.0; and I'm getting that error when I call to the method of "Managed Bean". I've followed the code statements in my code. Until Finally I've found the line that it throws that error. It's marked in bold. 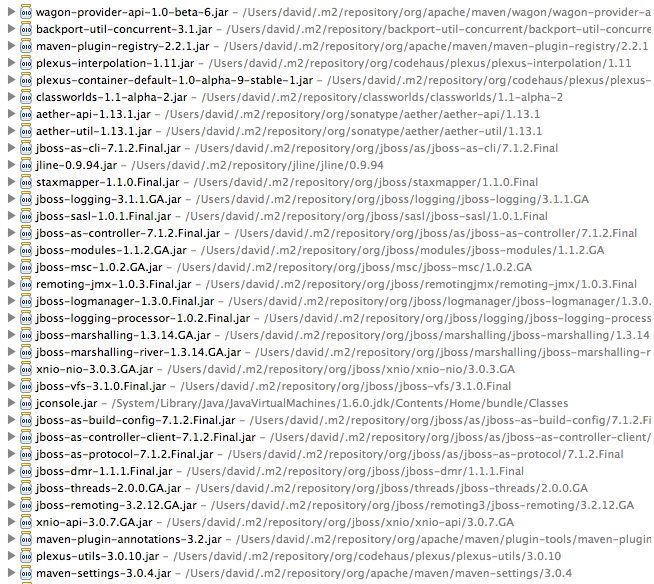 In the other hand, I've checked the configuration files of the JBoss server "standalone.xml"
What are you trying to do? Any special reason you don't just @Resource inject a Datasource or use JPA? I'm trying to inject local Datasource and Persitence Unit file with Hibernate. module.xml configuration file which is located in "com.mysql.jdbc.main" package and in the same directory I've added the driver of MySql "mysql-connector-java-5.1.24-bin.jar"
So, could tell me what I am doing wrong??? If you need more information or something I've not talked about my code ask me please! Deployment errors? Or is the jdbc driver class missing thing? You might have to have an explicit reference to the driver module through jboss-deployment-structure.xml or a MANIFEST dependecy. Are you targetting JPA or plain Hibernate? I think you would get @Resource Datasource injection just be having a datasource defined with a jndi name in standalone.xml. Yes, it's a doployment error. Although, It tells me that I've missed the driver class... it's not possible because, I added the driver class in the belonging folder. I'm targeting Hibernate. I've checked to replace this line of datasource, removing jta="true", but searching in the documentation I suppose that it's an irrelevante change. I'm following steps for this URL. Make sure that you do not have a copy of mysql-connector-*.jar embedded in your application. ie. in WEB-INF/lib or ear-file.ear/lib. While you're at it - list all jars, you might have hibernate.jars or other EE jars bundled that should be avoided. 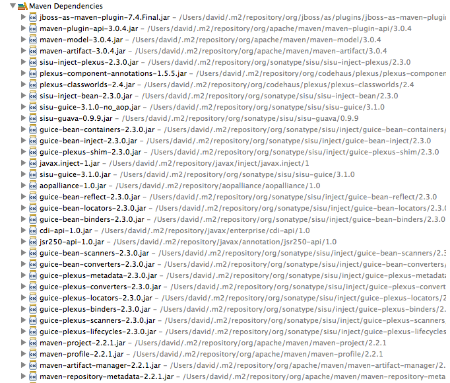 I'm using Maven 2, so I've all the jars in the m2 directory. Is it possible I'd forgotten to tell pom.xml where is the driver alocated?? I added the captures of jars. Ouch. That's a lot of jars, probably 80% dead weight but I don't see any jars related to the problem. Please attach your pom.xml file. 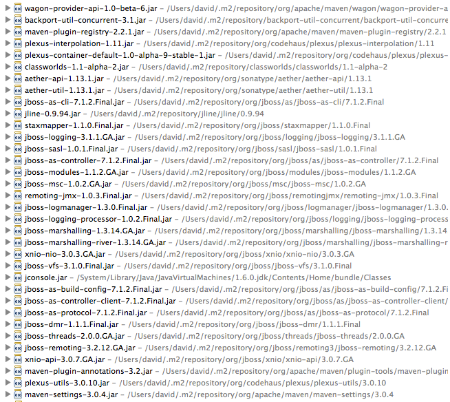 The dependencies that you've listed above look quite peculiar. Additionally, can you use the admin console to test the datasource connection? I've followed the URL, it's similar to I've implemented, but I did a few changes. What dependency I have to add to use Datasource object???? I've added this, but it doesn't detect the import of the object!!! 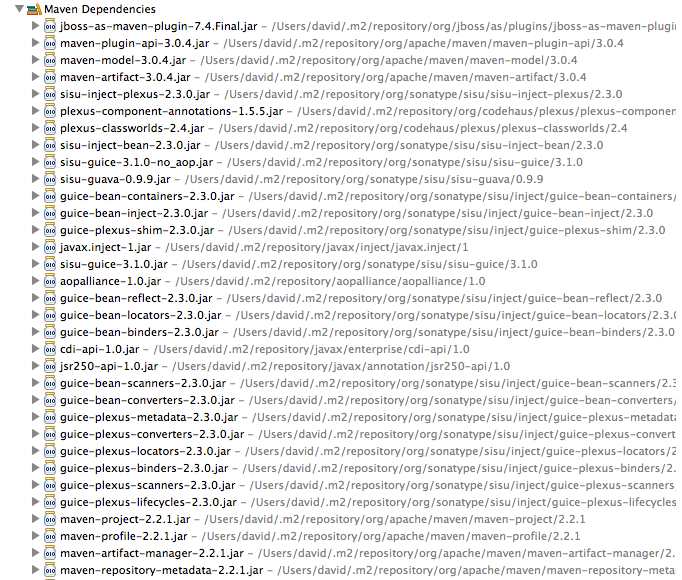 I've a few modules in my Maven project, so it's not going to be easy to post all of them, and obviously to follow it! Anyway, I post it all of them in different blocks in order to make easier you the reading. 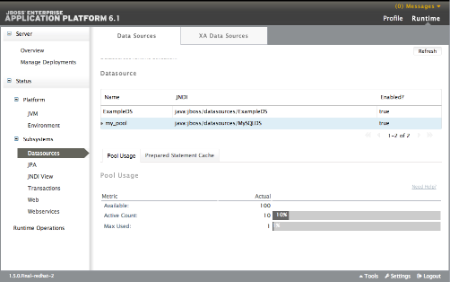 In the other hand, I've gain accessed to the Admin Console of JBoss EAP 6, How can I test the datasource connection? they include the mysql-connector-java-*.jar in your application. This is probably what's causing your CNFE. There is a classloader conflict. 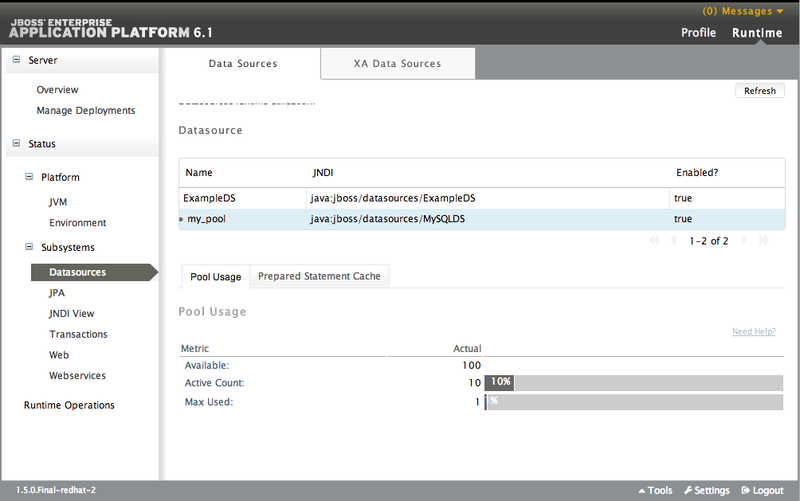 Using a datasource decouples your application from the type of JDBC driver that you're using. Thanks for helping!! I'm very desperated! !